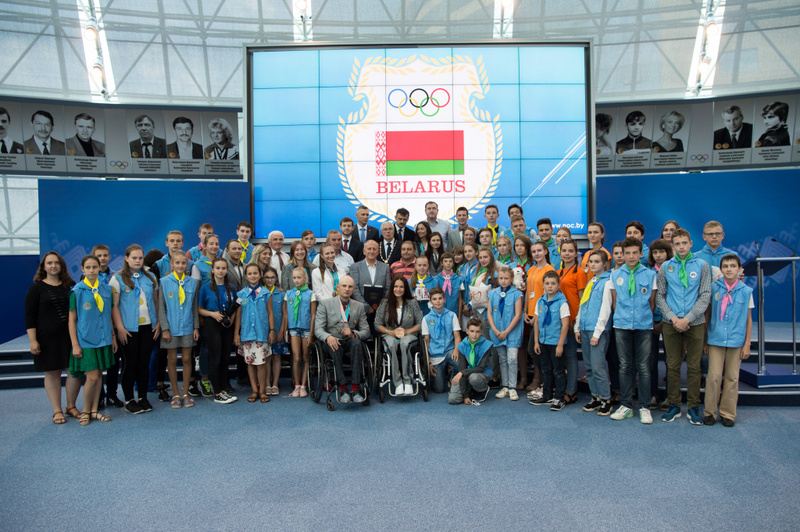 The presentation and solemn ceremony dedicated to cancellation of a postage stamps series “Medalists of the XXIII Olympic and XII Paralympic Winter Games in PyeongChang” took place on 20 July at the NOC Belarus HQ. The Belarus Olympians won three medals in PyeongChang. The Ministry of Communications and Informatization and Republican Unitary Enterprise of posts Belpochta issued three sets of postage stamps, each devoted to one particular trophy and its winner: the gold award of aerials triumphant Hanna Huskova, the silver of Darya Domracheva and the gold of the Belarusian women’s team of Darya Domracheva, Nadezhda Skardino, Iryna Kryuko and Dzinara Alimbekava in biathlon. Hanna Huskova was surprised to find herself on the stamps. She has already awaken to the fact that she is the Olympic champion. However, she cannot accustom to such attention to her person. “It is prestigious to watch a stamp with your face. It is an honor when your face not only gleams on TV, but also moves from one postbox to another”, thinks Huskova. PyeongChang 2018 Olympic champion in biathlon women’s relay Iryna Kryuko arrived at the NOC Belarus for a couple of hours between morning and evening training sessions to cancel stamps as well. 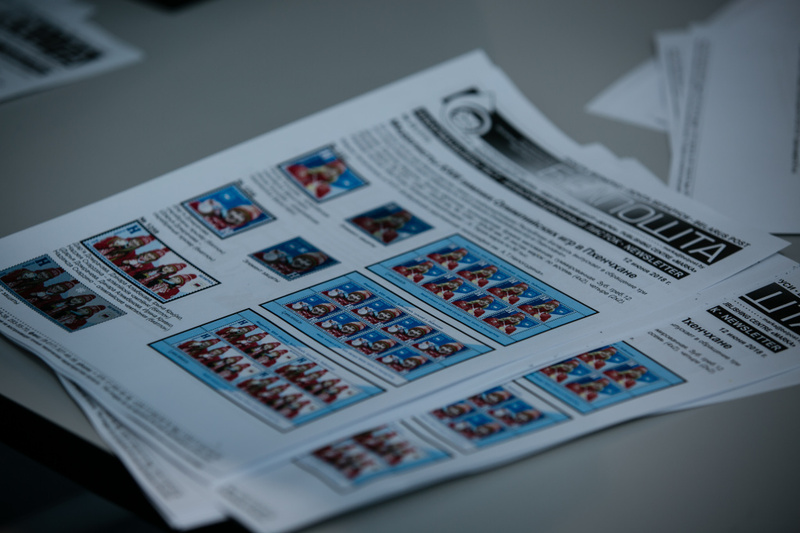 “I know how to use the stamps – I will utilize them to send autograph cards to my fans”, said Iryna Kryuko. 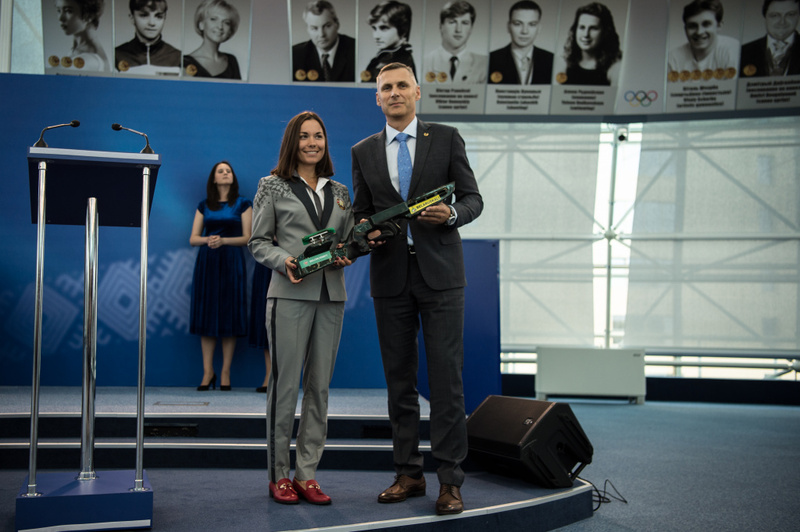 On behalf of the biathlon quartet, Darya Domracheva thanked all for the tradition to issue stamps with the Belarusian Olympians. She hoped the stamps would be a real treasure in every philatelic collection. 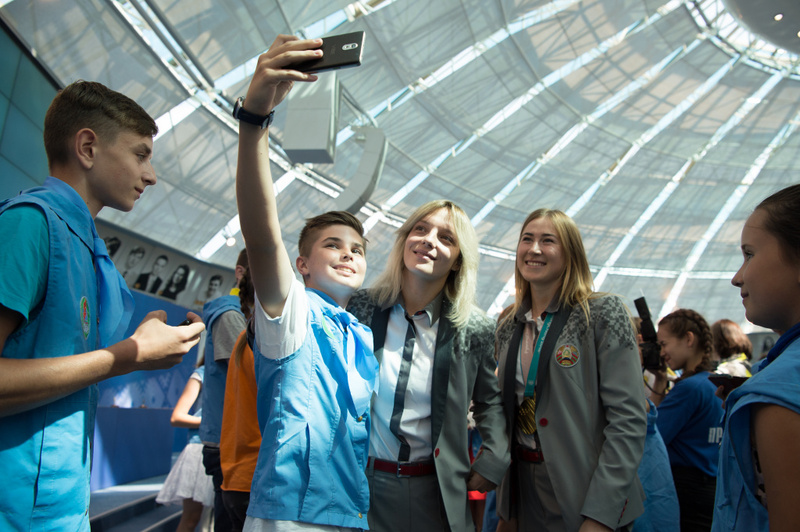 In response, the biathletes handed over some new items to the NOC Belarus Olympic Museum. 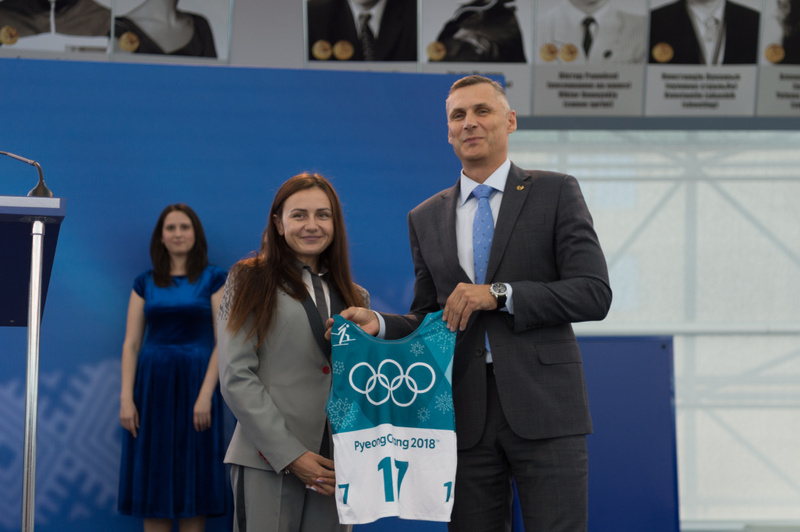 Darya Domracheva contributed her coat from PyeongChang 2018 parade apparel, Nadezhda Skardino – a rifle stock, Iryna Kryuko – a bib she put on for a gold medal relay, Dzinara Alimbekava – her sport uniform. 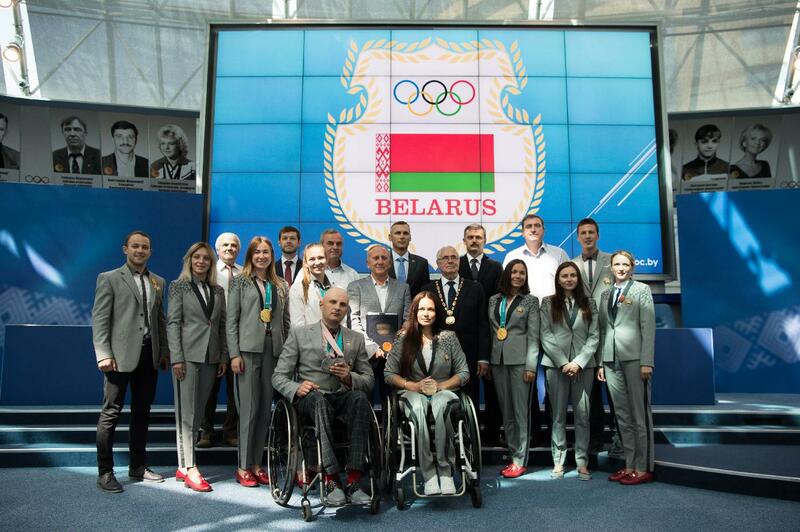 Success of the Belarusian Paralympians was also reflected in the stamps. Their performance at PyeonChang 2018 resulted in 12 awards in biathlon and cross country skiing. 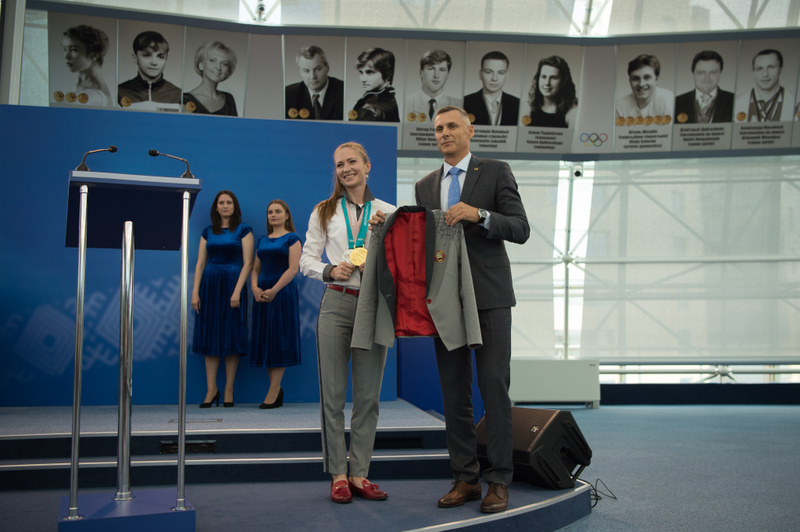 Paralympic champions in cross country skiing Sviatlana Sakhanenka and biathlete Yuri Holub, medalists in biathlon and cross country skiing Dzmitri Loban and Lidia Grafeeva took part in the ceremony along with their Olympic counterparts. 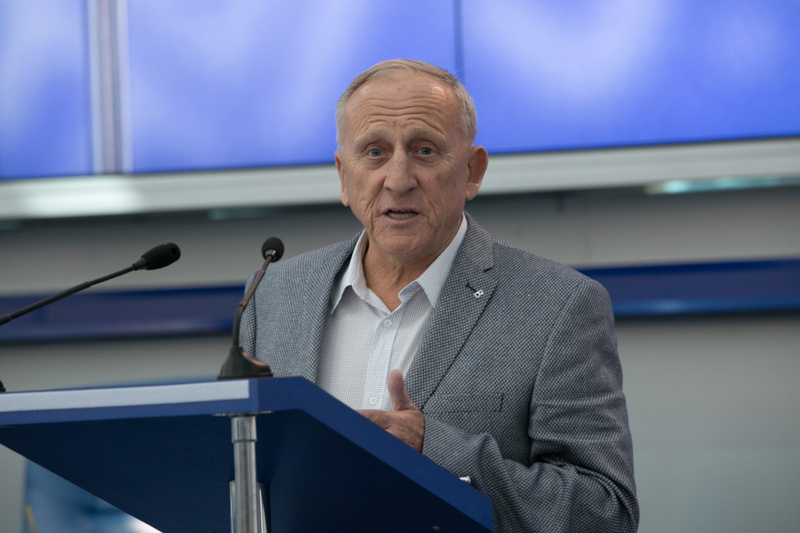 Though PyeongChang 2018 Paralympics were a triumph, Sviatlana Sakhanenka admitted there were a lot to do in future. “When you achieve a goal you had been pursuing all your life, it motivates you to work harder to replicate success”. 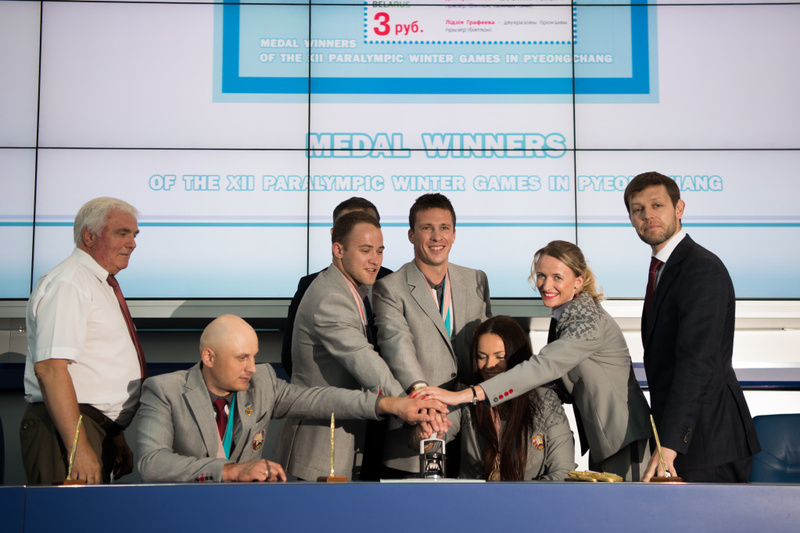 Head coach of the Belarusian national freestyle skiing team Mikalai Kazeka summed up importance of the postage-Olympics collaboration. He is convinced acknowledgment of merits on such level is important not exclusively for the athletes. 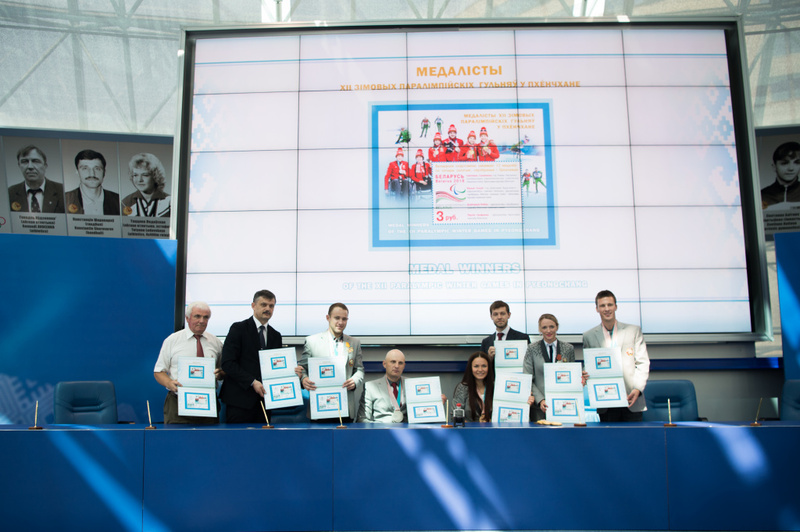 “It is a good tradition that Belpochta marks success of our athletes. The stamps they issue are spread all over the world among philatelists. They collect stamps throughout life and pass them to descendants. 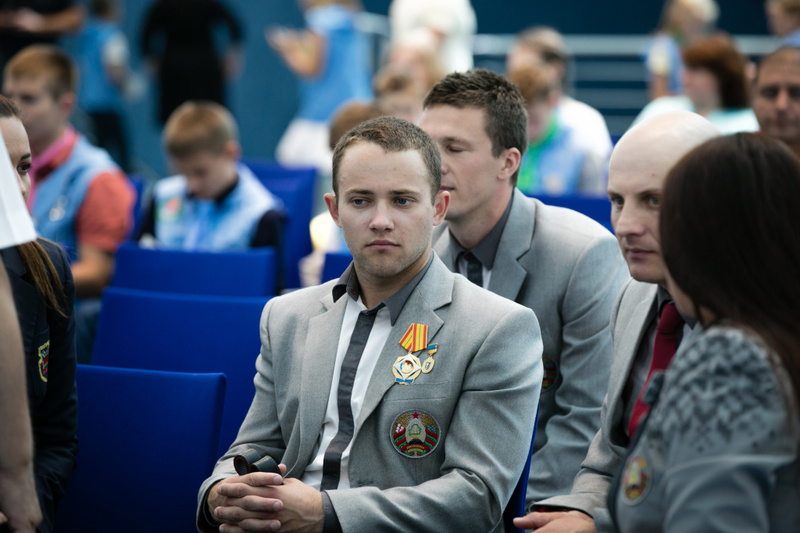 This is the way sport history of Belarus extends over the world". 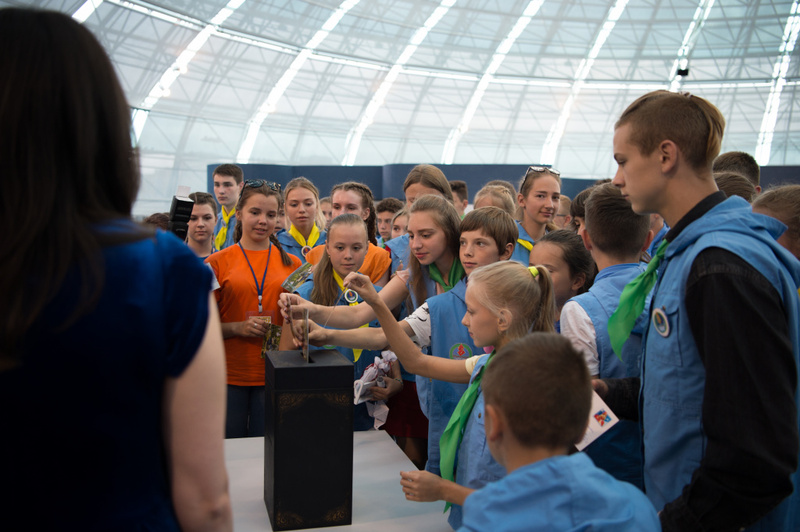 The first to use the stamps were the children from the national youth education and recreation center “Zubryonok”. The boys and girls who specialize in football, basketball, archery and chess sent symbolic cards to their coaches to thank them. They glue the recently presented stamps on envelops and put them into a special box. Another distinguished guest attended the ceremony of stamps cancellation. 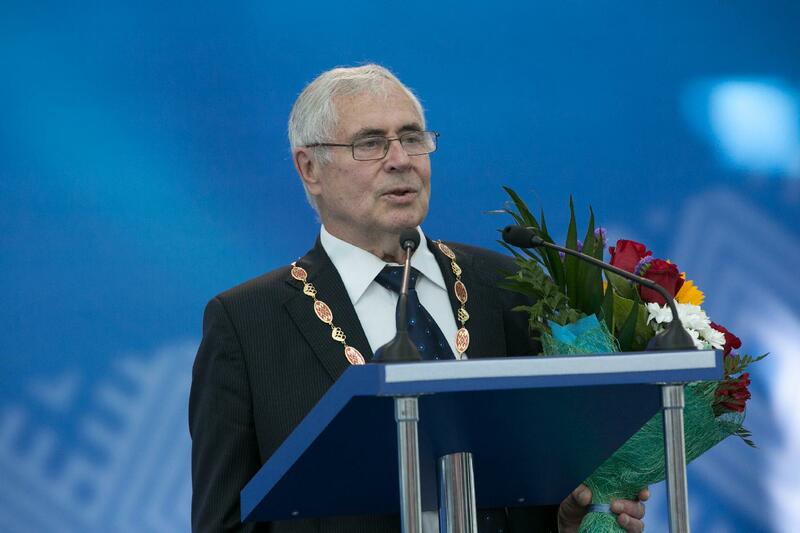 The legend of the Belarusian and Soviet handball Spartak Mironovich who turned 80 a month ago was awarded the Order of Honor of the National Olympic Committee of the Republic of Belarus. 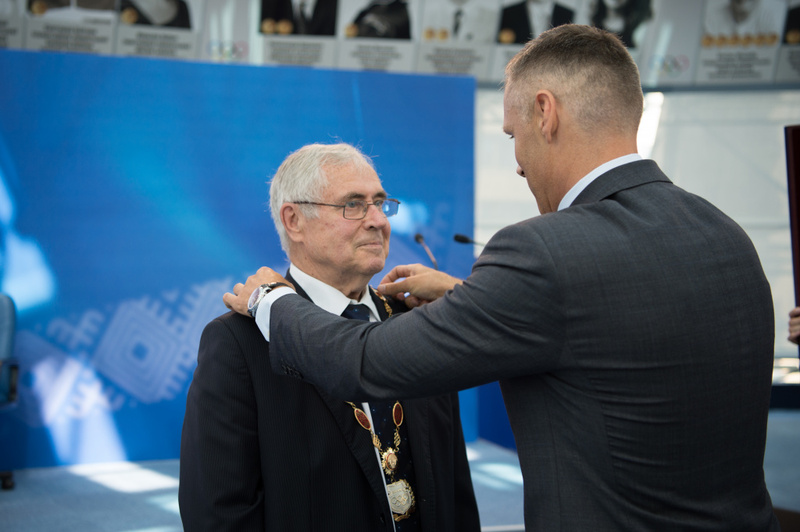 Spartak Mironovich received such a prestigious testimonial in recognition of immense contribution the Honored Coach of the USSR and BSSR paid to the development of the Olympic Movement, mass and elite sport in Belarus.